But I digress. I have come up with one way to deal with hyper children over the summer. I call this game “Put the kids in the closet”. They’re quiet, they’re contained. 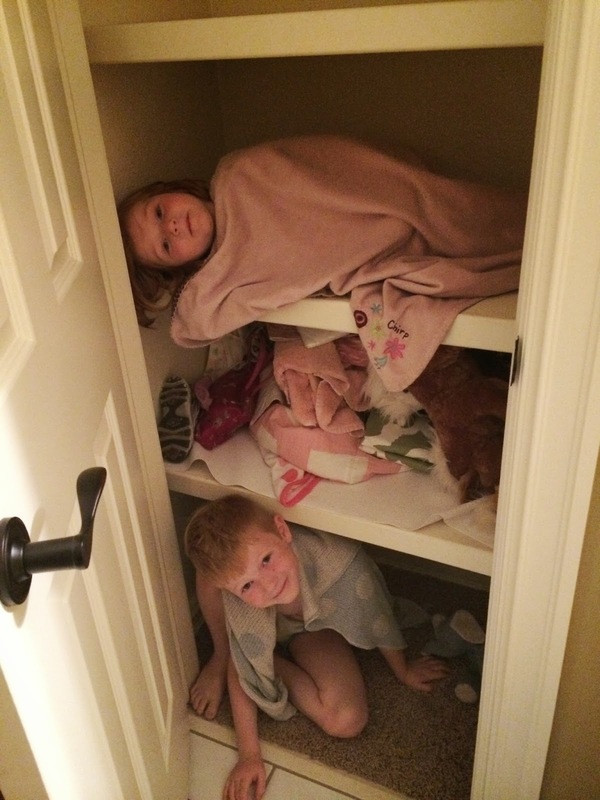 Hell, I read a whole book chapter while my kids were safely stored in the closet. Ok, so I can’t claim credit for this game. What really happened was that Hudson yelled at me from upstairs and asked me come upstairs and look at something. I was less than enthused since he asked me this several times today, sometimes with only a minute or two between requests, but when he added “I taught Kenzie something” I knew this would be interesting. I opened the bathroom closet door to find this. Although I am not the kind of parent who actually stores her kids in a closet, I am the kind of person who first grabbed her cell phone to take a picture before I told them to never ever do this again.